Along with Listener Greg G., I think it's time to take aim at the subtle Grinchiness around this blog with some joyous Christmas music. If the Christmas spirit hasn't got hold of you yet, these songs will provide an immediate cure. These are the rarest albums in the J's with Jamie catalog, culled from two LPs the group recorded as a Christmas gift for friends, family, and business associates. The first, Season's Greetings, bills the group as Jamie and the J. Silvia singers, while the second, Peace on Earth and Good Will Towards Men, carries the J's with Jamie name. 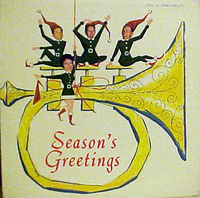 "Cool Yule" only appears on the first album. Columbia producer Ernie Altschuler got his first taste of the group's swinging style while they were in Chicago recording these tracks. He signed them to an exclusive record deal, launching the pop side of their career. There's a broad range of styles across the nine tracks. The first four are straight versions that echo the popular Christmas music of the early 1960s, though you'll have to look far to find harmonies executed and mixed this brilliantly. "O Come, O Come, Immanuel," the first a capella track I've heard from the group, is perhaps the best example. The modern songs all sparkle with the swinging sound that characterized the band's Columbia albums. "I Saw Mommy Kissing Santa Claus" defines the J's with Jamie sound. "Have Yourself a Merry Little Christmas" opens with the warm, soulful performace found on the group's sentimental numbers. There's no better version of this song in existence, in my opinion. For fun, there's "Cool Yule" with it's samba-infused beat and a cha-cha and Chipmunk take on "Rudolph, the Red-Nosed Reindeer." Check out Len Dresslar's singing on, "Won't you guide my sleigh tonight?" and you'll immediately recognize the voice of the Jolly Green Giant. Whether you've got your parents, mods, hipsters, dance or alternative fans rocking around your Christmas tree, these songs are sure to be a hit when they pop up on your Christmas playlist. Thanks go out to Jim Maroney for making this early Christmas present possible. I am loving the J's posts. Any chance the full quality .wav or .aif files could be posted or provided as a torrent for all of the J's material? So glad to finally see this posted. This is some of the best undiscovered Christmas music that has passed my way in a LONG time! Thanks Mr. Maroney and FMU! Great, great, great, great, great, great, great stuff here. This stuff is pure gold. Thanks for digging this out and sharing it with the world. Gee--I'm so old I actually remember paying for great Christmas music. Regarding torrents, out of respect for WFMU's bandwidth (which isn't free), I always cap the downloads at 192 kbps, which is the standard that Otis set for the 365 Days Project last year. When it comes to vinyl rips, I've found that there isn't a noticable bump in fidelity or audio quality when you sample at a higher rate, unless you're dealing with an album that's in very rough shape. I have long been unapologetic and un-ironic in my love of Christmas. Thanks for this. >I am loving the J's posts. Any chance the full quality .wav or .aif files could be posted or provided as a torrent for all of the J's material? Chris Bakos, you ungrateful f*cker. Be grateful for what is given. People like you, who ask ask ask, and don't give make me sick. Post a link to YOUR mp3 blog where you are sharing great music like this or SHUT UP! Any idea what year these were? All of the J's With Jamie posts only ever seem to say "the 60s."